An unbeatable combination of brilliant blue and silver keeps turquoise jewelry in high demand. Find out more about these semi-precious gems, and how to keep yours in tip-top shape. There seems to be no better companion for these beautiful blue gems than silver. The colors complement each other perfectly, and the silver tends to accentuate any matrix present, giving the entire piece more continuity. Turquoise jewelry is generally fashioned using sterling silver to make stunning rings, pendants, bracelets, and earrings. The silver can be a delicate filigree or a sturdy, ornate setting, depending on what best suits the intended design. The gems themselves can vary greatly, not only in color but also in the cut and polish. Turquoise can actually be ground down and reconstituted to form inexpensive gems or used in its rough natural state for a more authentic look. Southwest Silver Gallery: Find turquoise pendants, earrings, watches, and more. These styles are made by Native Americans and other artisans in the Southwest. Turquoise Trader Jewelry: This site offers Southwestern-style turquoise jewelry, from coral and turquoise watches to opal and turquoise hummingbird earrings. Treasures of the Southwest: Here, you'll find Native American jewelry including brooches, rings, cuff bracelets, and more. Each piece lists the artisan's name in the description, so it will be easy to find more of your favorites' work later. Durango Silver: There are beaded necklaces and vintage jewelry among this selection of turquoise rings, necklaces, bracelets, and more. Turquoise is one of the most easily recognized gemstones, prized for its sky-blue hues. It's been a favorite in the production of Native American jewelry, having been mined in the American Southwest region for hundreds of years. Deposits of the stone have also been mined in the Middle East, Europe, and Asia. Turquoise is actually a semi-porous stone, a composite of copper and aluminum that is generally found running in veins through copper mining sites. These opaque stones carry a hardness rating between five and six on the Mohs scale, well below the ten rating of the hardest mineral known to mankind, diamonds. Once polished, these gems take on a smooth, waxy luster. Color variations can be attributed to the fact that being a porous stone, other minerals are often mixed in as the crystals form along the sedimentary rocks in the copper deposits. 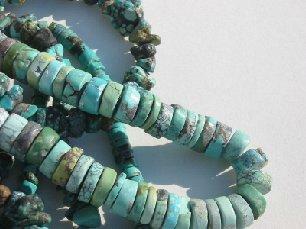 These trace minerals sometimes also form a web-like pattern throughout the turquoise that is referred to as "matrix". Although the purest stones bring the best prices, some people enjoy the extra character the matrix brings to a particular piece of turquoise jewelry. Experts can actually identify the region a piece of turquoise comes from just by the color and matrix of the stone. Since turquoise is rather porous, it can absorb impurities that will eventually alter its color and lustre. This is why it's important to take special care of your jewelry to preserve its beauty and value. Avoid using silver polishing solutions. Instead, gently polish your jewelry using a soft cloth. This will remove body oils and other substances that cause dulling and tarnish. Remove your turquoise jewelry before washing dishes or applying body lotions and perfumes. Remember, these substances can alter the color of your carefully selected gems. Never store turquoise amongst harder gems and metals that can gouge its surface. To reduce tarnishing, always store your jewelry away from the elements in a cotton bag. Each piece of turquoise carries its own personality and character, so when you choose your jewelry, look for pieces that speak to you. There is an old Native American saying that says "Not all stones are alive, but some are." Turquoise is definitely one of those stones.